The Motor Rewind & Repairs Department has capacity to repair fractional Kilowatt motors to 1000 Kilowatt motors and above. We specialise in single and 3 phase AC motors, alternators, welding plants, EXD flameproof motors, DC motors and generators. A 24-hour call-out and delivery service is available. 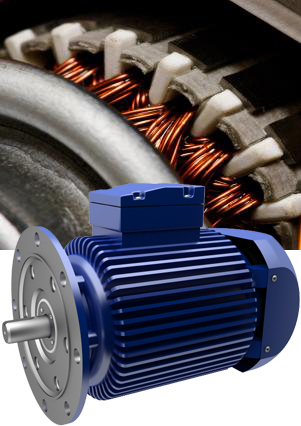 We can supply new motors direct from our comprehensive off the shelf range of motors up to and including 22 Kilowatt, with an optional overnight support service for larger motors. We operate a 24-hour breakdown and repair service, to respond to any problem within the industry, including specialist equipment such as cranes, pumps and hoists. Our quick and efficient response is supported with direct mobile communication with our engineers. We also provide a loan labour system to either supplement the client’s in-house maintenance personnel for holiday relief or to provide a full support team during plant shutdowns. For further information on motor control and Inverters click HERE and see how our panel shop can design and build bespoke control systems.